You know, I usually feel bad for the first team to lose on Thursday of the NCAA Tournament. (Note, I don't really count the Tuesday "play-in game" as the real start and I don't think anybody else does, either.) The tourney has just kicked off, many people are still at work (even the die-hards, who likely plan to take off Fri afternoon if they can't take both days), and the early games get going. And by about 2 PM, somebody is already done and packing their bags to go home. It's not even midafternoon yet! These poor kids don't get any of the evening excitement, the big national audiences, to have their score up there among tons of others, etc. This is one reason to be happy our Boilermakers aren't playing until Friday evening -- we're at least lasting until the end of the second day. My point is I usually feel bad for this first team to lose. But not this year. 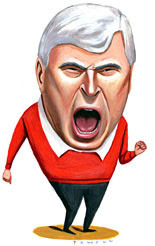 I couldn't be happier that the first team out belongs to, "The General," Bob Knight. Another stellar coaching performance, Bob. What a career to be proud of, going from a nationally-respected program that won three NCAA titles to what's most often called an "outpost" of college basketball where they can't come close to selling out the arena and you can't even hope to make noise in the big tournament. And for what? All because you're a jackass with zero control over yourself. I haven't seen his postgame press conference but I'm sure he acted like an a-hole, as per usual. Damn reporters, asking their damn questions.